One Momma Saving Money: Same Kind of Different as Me out now on Blu-ray! 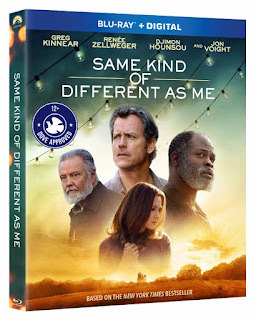 Same Kind of Different as Me out now on Blu-ray! “An inspiring, beautiful story about love” (Dave Morales, Fox TV Houston), SAME KIND OF DIFFERENT AS ME is out now! Purchase SAME KIND OF DIFFERENT AS ME on Blu-ray for $14.99! With all that is going on in the news today, it is refreshing to watch such a feel good movie! Same Kind of Different as Me is a faith-based drama based on the true story of a wealthy family who befriends a homeless man. Debbie Hall has a dream that she would meet a wise man on a road, and that he would change her life. When she encounters a homeless man who is frequent quest at a shelter she volunteers at she is convinced he is the man that would be the change. The Halls invite this man into their lives and learn more about forgiveness and spirituality. This movie also discusses the love of God and how important families are. It is a great family film!